After seeing the Ghost Hunters episdoe on this device and hearing that it's supposed to be tuned for ghost hunting, I had to pick one up and check it out for myself and see what is inside. During the Ghost Hunters episode entitled Manson Murders, Grant and Jason and the rest of TAPS meet up with Chris Fleming to investigate a haunted mansion which is located not to far from the famous Manson family murders of 1969. 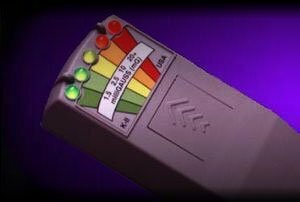 During the episode, Chris talks a little about the KII device and Grant states that it is specially caliberated for use by paranormal investigators. I wanted to know what made this device so special and what exactly is calibrated? At first glance there does not appear to be anything special about this device. It has 5 LEDs to show the potential threat of EMF and an annoying button that must be held down while you are taking readings. I did find that holding the button down and wiggling it could cause the device to reset about 1 out of every 10 tries in which case all of the LEDs would light up and go off to show that the device is working. This could be a potential problem while out investigating and may show a false positive. In the instructions written by Chris, it states your thumb could get tired pretty quick while operating the device, and he suggests that you push a dime or a toothpick into the button to hold it down. I decided just to install a rocker switch. Somthing of particlular interest about the KII is how it comes on, when you push in the button it will light up all of the lights, then do it again, I had first thought that maybe this is how they were getting the spirit to look like it was interacting with the device on the show, but after reviewing the show again, I realized that the response time is much slower then what they were recieving. Taking a look inside the device does not produce anything of interest. 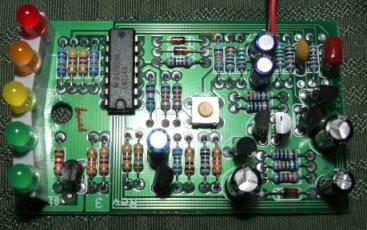 This is a basic EMF detector with average parts inside. There is nothing that can be calibrated aside of changing some of the parts to make it more sensative to certain frequencies, but unless these were assembled on site and soldered by hand, it does not look like any of the parts have been replaced. I would be interested to find out how this is calibrated if there is no settings inside. A few other points of interest that I found about this device is its sensativity to RF signals is a bit higher then your average EMF detector, but its sensativity to things like a TV is much lower. Putting this device nose first against the screen only lights up to the orange led, but using a standard EMF detector will yield full scale about 6 inches from the screen. Size & Weight: 5.7 inches long x 2.25 inches wide x 1 inch high, 6 ounces. I have been involved in an ongoing EVP investigation along with some other fellow investigators from the area. We meet for 2 hours a week and attempt EVP and other forms of communication hoping to open a repoire with the spirits of our known haunted location. For the KIIs first inital test, I put it up against some of the other meters we have in our group including the famous tri-field meter and the ever popular Gauss Meter as well as some other not so well known meters. Basically they were all sitting on a table with a couple audio recorders while we attempted EVP. Interestingly enough, the KII did happen to pick something up a couple of the times that the other meters did not register, so there may be something to this device, but I was not able to establish any kind of direct communication with the spirits as depicted on the Ghost Hunters show, but I will definitely continue trying.